The FCC estimates that more than 350,000 homes in rural areas of Michigan cannot connect to higher speed internet providers. 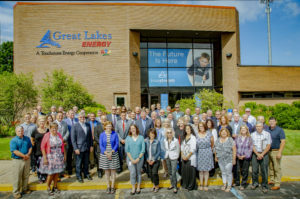 A great partner of NLEA, Great Lakes Energy, came in to help answer the call for higher speeds with the launch of their fiber internet and phone service, Truestream Fiber. Great Lakes Energy has begun constructing GLE’s high-speed fiber internet network in their Petoskey service district. 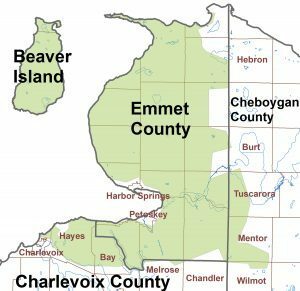 By 2020 or sooner GLE members of Emmet County, Beaver Island, and small portions of Charlevoix and Cheboygan Counties will have higher internet speeds, as shown in shaded portions of the map. If initial installation is successful with the pilot program, the process will be analyzed to determine the feasibility of expanding to other regions. The hope is that Truestream fiber will be available at the doorsteps in all their service areas. CEO Bill Scott made an impressive analogy as to why GLE is up for this task: in the electric age, rural areas were in the dark because utility companies weren’t providing them electricity; the same is true now for rural areas lacking internet. It’s great to see GLE propelling rural communities into the future, and undertaking this project as a utility company. Speaking of the future, fiber is “future-proof,” meaning the fiber installed today will be able to handle increased data loads as the need for more and more bandwidth and speed grows. Get ready for what’s coming! Want faster speeds brought to your home or business? GLE members can register at www.jointruestream.com. Spread the word to friends and neighbors; the more community members that register will help GLE decide where to bring the service next. As NLEA and county commissioners work to approve the Broadband Consortium to facilitate the development of Broadband in our four-county region, we will dovetail GLE’s efforts. Both programs coexist to help as many Northern Michigan business owners and residents achieve connection as possible. To continue the discussion of fiber, broadband, and what’s being done in your community, contact NLEA at 231-582-6482 or email info@northernlakes.net. Learn more about Truestream, call 888-485-2537 or email info@truestreamfiber.com.